A fantastic introduction to the practice of mindfulness meditation. The simple, down-to-earth techniques taught in “Easy Mindfulness Meditation” will help you develop the ability to focus your mind and free yourself from becoming entangled in negative thoughts or emotions. Mindfulness is the key to living calmly in the present moment. Mindfulness Meditation is one of the oldest forms of meditation, but it is now the world’s fastest growing practice for de-cluttering and calming the mind. It's also becoming the number one meditation technique recommended by therapists, psychologists and health care professionals. In "Easy Mindfulness Meditation" you will learn to focus your attention properly and you will come to see that you have a choice over what your mind pays attention to. This is an incredibly simple but important skill to develop! Rather than living in the past (memories) or somewhere in the future (often where worry lives) you will be more aware of the present moment and you will be able to observe your thoughts from a more relaxed point of view. This frees up your head-space so that you can enjoy living more a more fully present life in the "here and now". This non-religious, easy 3 step guide is practical and clear, and will quickly help you get started with your own daily practice. It's perfect for newcomers to meditation, and it's also useful for more experienced meditators who want a refresher course in how to focus their attention and become more present-minded. De-clutters and calms the mind – An understanding that you are NOT your thoughts. The ability to observe the contents of your mind without having to react to them. Being awake to the current moments reality instead of living on autopilot. More aware of your body and input from your senses. More focus on what is useful to you, and the ability to let go of what isn’t. Helps and relieves stress, anxiety and depression. Allows you the headspace to be more creative and productive. 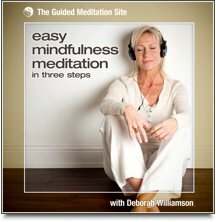 These Easy Mindfulness Meditations really are very straightforward and easy to follow. They are reasonably short, so they won't take up a huge amount of your time, and we keep them simple and don't use mystical music or difficult body positions. All you need to do is just sit where you are least likely to be disturbed and listen to your guide. 1. Listen to step one first, every day for about two weeks. 2. Then move on to step two, again every day for two weeks. 3. Then move on the step three for two weeks. You will find these meditation techniques very easy to adopt, and after six weeks you should have enough experience to practice mindfulness meditation without a guide at any time you like.